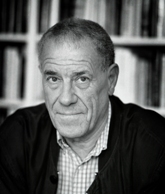 Per Wästberg, born 20 November 1933 in Stockholm. Writer. He was elected to the Swedish Academy on 17 April 1997 and admitted on 20 December 1997. Wästberg succeeded the writer Werner Aspenström to Chair number 12. He was awarded the Övralid prize in 1993, the Gerard Bonnier prize in 1995 and The Society of Nine Great Prize in 1997. Wästberg made his debut at a record young age in 1949, the same year as Lars Forssell and Östen Sjöstrand – but on entirely different grounds. He was a particularly precocious grammar-school boy. For some years at the beginning of the 1950s he founded a school. With the 15-year-old as an example the publishers went out and – in Wästberg’s words – “picked up writers in the school playgrounds”. They were looking for a new type of literature, the young, affirmative, direct literature as an opposite of the dominant, “difficult”, angst literature of the 1940s. Per Wästberg in a certain sense symbolised rebirth after the war. During this period the young Wästberg kept a diary. Half a century later he published his diary notes. Ung mans dagbok (1996; ‘Young man’s diary’) deals with the period 1946–50, from the age of twelve. As a portrayal of early post-war Stockholm filtered through the eyes of a precocious city child the book is invaluable. The next year, 1997, this was followed up with En ung författares dagbok (‘A young writer’s diary’), Wästberg’s private notes from 1951–53 on his first, trembling period as an author. The debut Pojke med såpbubblor (‘Boy with soap-bubbles’) is a modest collection of short stories with an autobiographical touch, set in one of three scenes that recur throughout his writing: the Stockholm archipelago. (The other two are Stockholm city centre and Africa.) The light, sure, elegant prose that was to be Per Wästberg’s hallmark is already foreshadowed in his debut. Following the novel Ett gammalt skuggspel (1952; ‘An old shadow-play’) Wästberg started writing literary criticism in the national daily Dagens Nyheter in 1953, where he later became cultural editor and editor-in-chief between 1976 and 1982. It soon proved that the infant genius had developed into a real author. In 1955 came the first truly mature novel, Halva kungariket (‘Half my kingdom’), an outspokenly romantic and ironical, picaresque work about two young lovers on a voyage of discovery through Stockholm and its surroundings. Some years later the book was followed up with what was to be the untiringly productive author’s last novel for a decade. Arvtagaren (1958; ‘The heir’), one of Wästberg’s foremost novels, is about an innocent young Swede’s wanderings through a post-war Germany razed to the ground. The young Stockholmer Mattias Vindrot sets out in search of one Herr Meyer, who his father, the biscuit manufacturer, wants to teach his son his trade. Meyer proves elusive, and Mattias has to try some temporary jobs and meets many people, falls in love and ends up in an unexpected career. The novel gives a thought-provoking picture of the confrontation of Swedish innocence with war-ravaged Europe. In Wästberg’s writing we can as in few others’ follow the movement from almost complete innocence to world awareness. To an unusually high degree the whole of his life is reflected in written form. It is for this reason the journey plays such a large part in his writing. It is used to confront a certain degree of naivety with the unknown. The travel motive from Halva kungariket expands in Arvtagaren till Europa – and when during the following years it expands even outside Europe it is no longer the novel that is the most congenial genre. Per Wästberg now becomes a travel writer and in addition the most important introducer of African literature to Sweden. The two books from 1960 are important period documents. Förbjudet område (‘Forbidden area’) from Rhodesia, while På svarta listan (‘On the black-list’) from South Africa mix genres as diary, portraits and political analysis in order to illustrate the shock when a neutral Swede meets the everyday of apartheid. The books spread far outside the Nordic countries and gained great importance for Swedish commitment to Southern Africa. And in the rich anthology of 1961, Afrika berättar (‘Africa tells’), which came out in an expanded version in 1970, Wästberg managed to point out most essential African writing. A summing up of his South African commitment came in 1995 in the voluminous I Sydafrika – Resan mot friheten (‘In South Africa – the journey towards freedom’). In 1964 Wästberg started Swedish Amnesty together with the solicitor Hans Göran Franck, in 1967 he became chairman of the Swedish PEN-club, later also of the international PEN-club for some ten years; and in an article in the evening newspaper Expressen on 4 August 1967, written together with Thomas Hammarberg, he coined the idea of “converting Sweden into a multicultural society”. Despite his political commitment he became suspect during the politicised half of the 1960s. The reason was the novel trilogy on love in Stockholm of the 1960s. Vattenslottet (1968; ‘The water castle’), Luftburen (1969; ‘Airborne / The air cage’)* and Jordmånen (1972; ‘The soil / The earth-moon’)** take place in upper-class surroundings and are written in airy, light, prose-poetic language with intentionally stylised, occasionally aphoristic dialogue. The trilogy enjoyed great general success and was read and discussed as a generation document about various types of open relationship between modern adult people. The trilogy was followed up by a tetralogy. A quartet of novels is about diplomat Johan Fredrik Victorin, traveller in Africa Wilhelm Knutson and municipal architect Ellen Mörk in Stockholm and the Cameroons. Eldens skugga (1986; ‘The shadow of the fire’), Bergets källa (1987; ’The spring of the mountain’), Ljusets hjärta (1991; ‘The heart of the light’) and Vindens låga (1993; ‘The flame of the wind’) explore the nuances of sensual experience, stages of devotion in love, clarity of vision, continual discovery. In the figures there is a split between adventure and middle-class values, uncertainty and conformity, the wisdom of diplomacy and the infatuation of passion. More recently Per Wästberg has published as a poet with works including En avlägsen likhet (1983; ‘A remote similarity’), Förtöjningar (1995; ‘Moorings’) and a trilogy of three-line poems: Tre rader (1998; ‘Three lines’), Raderingar (1999; ‘Erasures’ [or ‘Etchings’]) and Fortifikationer (2001; ‘Fortifications’). Short prose and aphorisms are collected in Obestämda artiklar (1982; ‘Indefinite articles’) and Frusna tillgångar (1990; ‘Frozen assets’). Wästberg has portrayed various parts of Stockholm in e.g. Klara (1957), Östermalm (1962), Humlegårdsmästaren (1971; ‘The master of Humlegården’) and Kring Johannes (1994; ‘Around Johannes’) – a genre that mixes reporting, interviewing and memoirs. Per Wästberg’s legendary productivity has shown no sign of abatement in the new millennium. There followed the fine memorial to his relative, the pioneer of popular education Axel Hirsch (2002), who devoted his life to the struggle for social reform, and the mixed bag Övergångsställen (2003) (Zebra Crossings, a vigorous mixture of anecdotes and reflections, travel sketches and biographical notices – here, too, many autobiographical passages. It was then time for a more thoroughgoing series of memoirs, two volumes of which have been published so far (2009). The memoir suite starts with De hemliga rummen (2006) (The Secret Spaces), covering the years 1939 to 1953. This is a light, beautiful, young book from a time when things retain their childlike magic and lustre. The summers spent in the Archipelago are happy, and the descriptions of a first love are completely captivating. After this, the second volume, Vägarna till Afrika (2007) (The Roads to Africa), comes as something of a shock. The childhood idyll suddenly fills with political and moral realities. The dark continent calls, Wästberg breaks away from the idyll and becomes a different person. He comes to Africa in “the gap between colonial rule and independence”. “A shift in the wind of my existence”, as he writes. It is interesting that Per Wästberg the next year tackled an entirely new genre, the biographical novel, in Anders Sparrmans resa (2008) (Anders Sparrman’s Journey), not just because it was his first novel for fifteen years but also because it is typical of his untiring urge to discover. Anders Sparrman (1748-1820) was the Uppland priest’s son who at the early age of seventeen set off to the East Indies and China on a commission from Linnaeus. In Anders Sparrmans resa the many journeys he made during his life, including the voyage around the world in James Cook’s vessel, Resolution. “I have gathered shards and fragments and pieced them together with various kinds of glue. From the haze, faces have emerged, none complete, none fully visible: a man of the Enlightenment on the verge of the more sentimental Romantic age, a figure with whom I have identified myself more than with any other”.